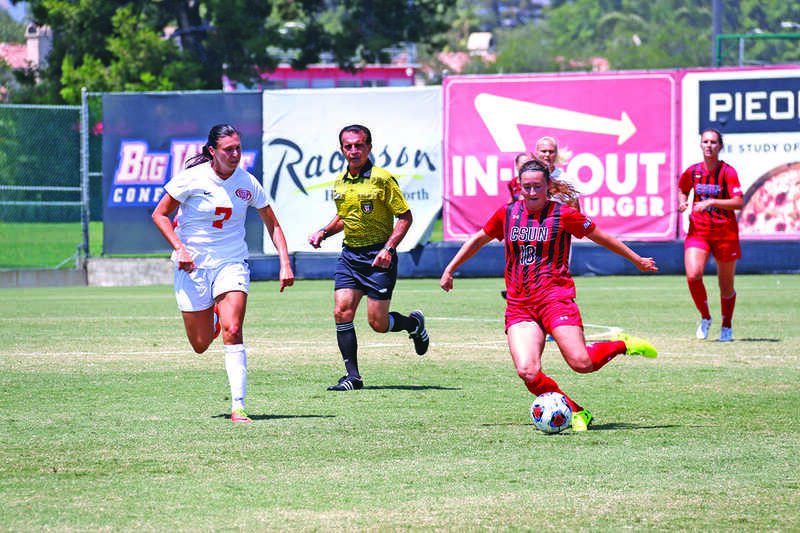 Pacific defender Hannah Terry scored in the 85th minute from 50 yards which spoiled the Matadors’ home opener with a 1-1 tie. The goal from Terry overshadowed the early start the Matadors got on, in part to Sylvia Trinh and Marissa Favela. Trinh took a corner kick and crossed a well-placed ball with Favela adding the finish, giving Northridge the 1-0 lead in the third minute. The Matadors missed several opportunities in the second half including the penalty kick taken by Cynthia Sanchez in the 62nd minute. Sanchez’s shot went far post and was denied by Regan Heslop. After the 90 minutes of regulation, CSUN registered three shots on goal in the two 10 minute extra periods, but couldn’t find a way to get a shot past Heskop who didn’t start, but played the entire second half and extra time. Big West goalkeeper of the year, Jovani McCaskill, said she had a lapse of judgement after the 1-1 result and wants the team to move forward to Thursday night’s home matchup against Houston. “I feel I haven’t been playing to the level I know I can play at and I need to be at my best. If I’m at my best then the team is at their best,” McCaskill said. “Now we need to come out with more focus against Houston. They may play different teams but they haven’t faced us. We just need to play one play at a time, one minute at a time, one goal at a time and we will take it to them. CSUN will continue home games Thursday night against Houston at 7 p.m.